Gmail Send Later is about to change the way you send emails. Right now, you work around your inbox. You write and send emails at the exact moment you want them delivered. 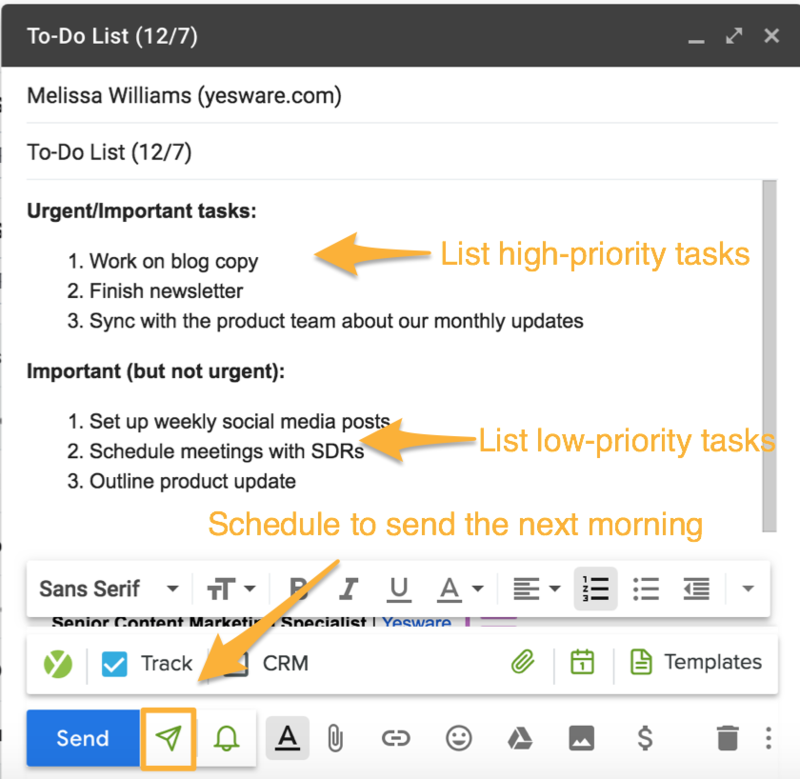 With Send Later, you take control of when your emails arrive to your recipient’s inbox and turn around five common problems below. Here’s a free email scheduler for Gmail (free trial that doesn’t ask for a card). Sometimes you’re ahead of the game. How to solve this: You can write emails at your convenience and deliver at theirs. If you send an email first thing in the morning from the East Coast to someone on the West Coast, you’re going to get buried in their inbox. They’re probably still asleep. The fix? Set your email to send when your recipient will be at their desk. There’s an easy way to do this, thanks to the Marketing team at Yesware. Visit our Best Time to Send Email Map. See when recipients are opening your emails with this invisible email tracker. Natural-born procrastinators are everywhere. They’re the people who need an extra little nudge to get work done. You can’t constantly remember to nudge people to complete their tasks, especially when you have your own to get through. What to do: As soon as you agree on the deliverable, schedule an email that checks in, and have it send right before the task is due. Hint: buffer in enough time to get the task right then. Managing your workload and personal life can become a balancing act. It’s easy to let simple tasks slip through the cracks (think: paying rent, submitting expenses, presenting slides at a meeting). How Gmail Send Later solves this: Start by sending yourself an email alert that arrives in your inbox first thing in the morning. For example, I do this at the end of the workday. The list arrives where I work (my inbox) and I can read it the second I sit down at my desk to get right to work. Your senior co-workers are spending a lot of time in meetings. Which means they aren’t spending their time in their inbox. You have to catch them at the right time or you risk getting buried underneath other requests. How to solve this: Start scheduling your emails to send when you know they’ll be checking email, so you’re first in line in their inbox. Not sure what timing is best? Use email tracking to get real-time alerts when your messages to your boss are opened. Then, start adjusting your send time accordingly. Transform your Gmail inbox without any customization on your end. With a free Yesware trial, you can work smarter and faster. Click the green “Later” button. Select the date and time you want your email to send. Choose your recipient’s time zone. Email Tracking: Shows you where and on what device your emails are being read (don’t worry — it’s completely invisible to recipients). Email Templates: Allows you to personalize your outreach in seconds. You can save templates for later and see what messaging works best with reporting. Campaigns: Lets you schedule personalized touch types at once (think: easy bulk email and automated follow-ups based on opens and replies). Book A Time: Eliminates the back and forth of meeting scheduling so you can send the times you’re available and your recipient can book right away.